A parolee who allegedly battered his girlfriend and held her against her will in their Bay Terraces apartment early Tuesday was taken into custody after a four-hour standoff. The woman reported the alleged domestic abuse in the 6800 block of Potomac Street about 5:15 a.m., telling dispatchers her boyfriend had access to a gun, according to San Diego police. It was unclear if she had suffered any serious injuries. The suspect, identified as 38-year-old Isaac Cross, retreated into the apartment when patrol personnel arrived and refused their repeated orders to exit and give himself up, SDPD public-affairs Officer Billy Hernandez said. 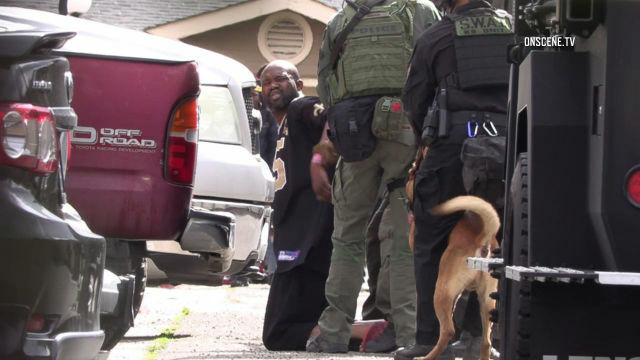 After several hours without progress in the stalemate, a SWAT team was called in to take up positions around the residence and take over negotiations with the suspect. With nearby dwellings evacuated, snipers took up positions on rooftops around the complex with their rifles trained on the unit where the suspect was hiding out. Finally, at about 9:30 a.m., Cross walked outside and surrendered peaceably. He was booked into San Diego Central Jail on suspicion of assault, kidnapping, false imprisonment, inflicting injuries on a cohabitant, making criminal threats and violation of parole. Cross was being held without bail pending arraignment, scheduled for Thursday afternoon.